Coding accurately for HIV infections and their associated problems can be difficult, making inpatient HIV admissions easy targets for recovery auditors. 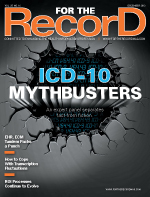 Complicating matters is the fact that recovery auditors aren’t necessarily inpatient coders with diagnosis-related group (DRG) experience; the reviewer may be a nurse or a certified outpatient coder, and I’ve even received a DRG change that was performed by an apprentice outpatient coder. Because facility coders can’t control who will review and possibly change the original coding and DRG assignment, it’s particularly critical to make sure that provider documentation of the patient’s disease stage is clear and without ambiguity. Coders must know the expectations for HIV coding, the risks of coding from minimal or ambiguous documentation, and the exceptions to the HIV coding rules. Some of the basic rules for HIV coding are well-known. If the patient currently has or is documented as ever having any HIV-related condition, then the code assignment from that time forward must be 042. Even if the patient is asymptomatic on the current encounter, the code remains 042. Remember that terms in parentheses in the index are nonessential modifiers; the words “disease” or “illness” may or may not be present, but their presence or absence won’t alter the code assignment. There is a subterm under HIV infection indicating that if the patient is symptomatic, the code returns to 042. However, there is no subterm under HIV indicating that if the patient is asymptomatic the code must revert to V08. Consequently, an HIV diagnosis with no further documentation is assigned to code 042. When the disease was commonly documented as AIDS or “full-blown AIDS,” there was little doubt as to the disease stage. But today’s physicians are more likely to use the terms “HIV” and “HIV infection” interchangeably, unaware that the terms may be interpreted differently by the ICD-9-CM index. These terms also may be interpreted differently depending on the coding policy’s conservativeness and the postdischarge auditor’s aggressiveness. If the physician documents “the patient has HIV,” the coder technically would be correct by coding 042, but that won’t stop an auditor from changing the DRG assignment if the patient also was asymptomatic on this particular encounter. Organizations can appeal, citing that the ICD-9 indexes “Human immunodeficiency virus, not further specified” to code 042. They can point out that only the physician’s diagnosis is required for the code to be correct. An experienced inpatient coder can explain that the physician must document the diagnosis as “asymptomatic HIV infection status” for code V08 to apply rather than documenting a patient as having HIV and also being asymptomatic. But the appeal may be denied because “asymptomatic HIV infection status” is coded to V08, and the auditor may believe that it equates to “asymptomatic on this encounter” unless the physician has clearly stated that the patient actually has HIV disease/AIDS. Ultimately, it is the responsibility of the coder to clarify ambiguous documentation. An EMR can make it more difficult to document the diagnosis correctly. If the medical staff is inclined to copy old medical history into current problem lists, the original diagnosis of HIV positive may not be updated to reflect the patient’s current AIDS status. The coder may find AIDS documented by a consultant in a progress note, but if all of the diagnoses in the problem list and discharge summary continue to read only HIV infection, then there’s a good chance that an auditor will change code 042 to V08. AIDS-defining conditions and illnesses as published by the World Health Organization (WHO) and the Centers for Disease Control and Prevention (CDC) clinically identify conditions when an HIV-positive patient can be reported as having advanced to HIV/AIDS status, but this does not change coding rules. If the chart indicates the patient is HIV positive or has an HIV infection and also has a condition that is on the AIDS-defining conditions list, the coder may not make the decision to code for AIDS. The physician can use the conditions to guide his or her diagnosis, but the coder must query for documentation of any possible cause and effect. However, if the physician documents “HIV infected C-2,” a severely symptomatic CDC classification, the coder can report the diagnosis as 042. In this example, it is the provider who makes the link between cause and symptoms in a diagnostic statement. • “Probable” diagnoses: If the physician documents at discharge that a condition is probably caused by HIV or that the patient probably has AIDS, there is a coding rule exception. If there is any doubt that the patient has symptomatic HIV disease, then code 042 may not be used. • Pregnancy: If the patient is pregnant, whether she has AIDS or is only HIV positive, the primary code in both cases will be 647.6X, Other specified infections and parasitic diseases in the mother classifiable elsewhere but complicating the pregnancy, childbirth, or the puerperium, with X replaced by the appropriate fifth digit for the visit. The subsequent code will be 042 if the patient has HIV/AIDS or V08 if she is only HIV positive. • Respiratory failure: There are exceptions to principal diagnosis sequencing if the underlying cause is an AIDS-related illness. If the patient is admitted for acute respiratory failure because of AIDS-induced pneumocystosis, code 042 must be sequenced first, followed by codes 518.81 and 136.3 for acute respiratory failure and pneumocystosis, respectively. Chapter-specific guidelines for infectious diseases take priority over general coding guidelines. Similar sequencing exceptions include cases in which a patient is admitted for AIDS-induced cachexia or diarrhea and dehydration from cryptosporidiosis due to AIDS. • Infants: Code V08 can’t be used for babies younger than 18 months who are diagnosed as asymptomatic HIV positive. Because the infant may have circulating antibodies from the mother, not from its own infection, these cases should be reported with 795.71, Nonspecific serological evidence of HIV. This article includes several of the most problematic rules when dealing with postpayment audits and DRG changes, but it is by no means a complete listing. Educate physicians to use terminology that will result in correct coding and reporting of a patient’s true severity of illness and HIV status. Query for clarification if documentation is minimal or unclear about disease status. In any event, be prepared to defend your coding with knowledgeable appeals and appropriate references to Official Coding Guidelines and Coding Clinic publications.